J.C. Skou, Overview: The Na,K-Pump. Preparation of Na+,K+-ATPase and Subunits. P.L. Jorgensen, Purification of Na+,K+-ATPase: Enzyme Sources, Preparative Problems, and Preparation from Mammalian Kidney. J.C. Skou and M. Esmann, Preparation of Membrane Na+,K+-ATPase from Rectal Glands of Squalus acanthias. T.W. Smith, Purification of Na+,K+-ATPase from the Supraorbital Salt Gland of the Duck. G.L. Peterson and L.E. Hokin, Preparation of Na+,K+-ATPase from Brine Shrimp. K.J. Sweadner, Preparation of the ga(+) Isozyme of the Na+,K+-ATPase from Mammalian Axolemma. M. Esmann, Solubilization of Na+,K+-ATPase. E. Skriver, A.B. Maunsbach, H. Hebert, and P.L. Jorgensen, Crystallization of Membrane-Bound Na+,K+-ATPase in Two Dimensions. W.J. Ball, Jr., T.L. Kirley, and L.K. Lane, Preparation of Antibodies to Na+,K+-ATPase and Its Subunits. Assay of Na+,K+-ATPase Activity. M. Esmann, ATPase and Phosphatase Activity of Na+,K+-ATPase: Molar and Specific Activity, Protein Determination. J.G. Norby, Coupled Assay of Na+,K+-ATPase Activity. M.D. Resh, Identification and Quantitation of Na+,K+-ATPase by Back-Door Phosphorylation. Reconstitution of Na,K-Pump Activity. S.M. Goldin, M. Forgac, and G. Chin, Reconstitution of Na,K-Pump Activity by Cholate Dialysis: Sidedness and Stoichiometry. L.E. Hokin and J.F. Dixon, Reconstitution of the Na,K-Pump by Freezeb1Thaw Sonication: Estimation of Coupling Ratio and Electrogenicity. F. Cornelius, Incorporation of C12E8-Solubilized Na+,K+-ATPase into Liposomes: Determination of Sidedness and Orientation. Analysis of the Pump Cycle. R. Blostein, Measurement of Na+ and K+ Transport and Na+,K+-ATPase Activity in Inside-Out Vesicles from Mammalian Erythrocytes. S.J.D. Karlish, Measurement of Active and Passive Na+ and K+ Fluxes in Reconstituted Vesicles. Measurement of Ligand Binding and Distance between Ligands. J.G. Norby and J. Jensen, Measurement of Binding of ATP and ADP to Na+,K+-ATPase. E.T. Wallick and A. Schwartz, Interaction of Cardiac Glycosides with Na+,K+-ATPase. S.R. 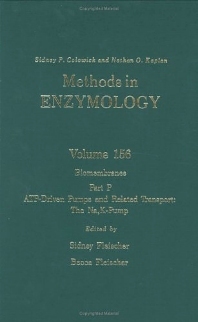 Hootman and S.A. Ernst, Estimation of Na,K-Pump Numbers and Turnover in Intact Cells with [3H]Ouabain. H. Matsui and H. Homareda, Measurement of Binding of Na+, K+, and Rb+ to Na+,K+-ATPase by Centrifugation Methods. J.D. Robinson, Estimating Affinities for Physiological Ligands and Inhibitors by Kinetic Studies on Na+,K+-ATPase and Its Partial Activities. L. Beaugi, Inhibition of Translocation Reactions by Vanadate. Measurements of Conformational States of Na+,K+-ATPase. S.J.D. Karlish, Use of Formycin Nucleotides, Intrinsic Protein Fluorescence, and Fluorescein Isothiocyanate-Labeled Enzymes for Measurement of Conformational States of Na+,K+-ATPase. J.C. Skou and M. Esmann, Eosin as a Fluorescence Probe for Measurement of Conformational States of Na+,K+-ATPase. I.M. Glynn, D.E. Richards, and L. Beaugi, Rapid Ion-Exchange Technique for Measuring Rates of Release of Occluded Ions. Modification of Na+,K+-ATPase. P.L. Jorgensen and R.A. Farley, Proteolytic Cleavage as a Tool for Studying Structure and Conformation of Pure Membrane-Bound Na+,K+-ATPase. W. Schoner, M. Hasselberg, and R. Kison, Irreversible and Reversible Modification of SH Groups and Effect on Catalytic Activity. W. Schoner and G. Scheiner-Bobis, Photoaffinity Labeling with ATP Analogs. B. Rossi and M. Lazdunski, Affinity Labeling of the Digitalis-Binding Site. W.S. Craig, Determination of Quaternary Structure of an Active Enzyme Using Chemical Cross-Linking with Glutaraldehyde. W.-h. Huang, S.S. Kakar, S.M. Periyasamy, and A. Askari, Use of Cross-Linking Reagents for Detection of Subunit Interactions of Membrane-Bound Na+,K+-ATPase. Magnetic Resonance Studies of Na+,K+-ATPase. C.M. Grisham, Nuclear Magnetic Resonance Investigations of Na+,K+-ATPase. M. Esmann, Electron Spin Resonance Investigations of Na+,K+-ATPase. Biogenesis and Membrane Assembly. J.W. Schneider, R.W. Mercer, E.J. Benz, Jr., and R. Levenson, Molecular Cloning of Na+,K+-ATPase *ga Subunit Gene Using Antibody Probes. M. Kashgarian and D. Biemesderfer, Preparation and Use of Monoclonal Antibodies to Na+,K+-ATPase. Microscopy of Na+,K+-ATPase. H. Mayahara and K. Ogawa, Histochemical Localization of Na+,K+-ATPase. A.B. Maunsbach, E. Skriver, and P.L. Jorgensen, Analysis of Na+,K+-ATPase by Electron Microscopy. Author Index. Subject Index. Biochemists, enzymologists, microbiologists, pharmacologists, biomedical researchers, biophysicists, analytical chemists, and physiologists. Vanderbilt University, Nashville, Tennesse, U.S.A.